Organic synthesis enables the precise generation of functional molecular building blocks and constitutes the basis of chemical approaches that our group is developing to address current challenges in materials science. Check out our group's research: highlight or poster or short interview. Read the Angewandte Chemie author profile about SH either in English or German. In this video clip, Stefan Hecht uses a historical setting to motivate his research on photoswitchable molecules that act as optically addressable gates in future transistor and other devices. In this video clip, Stefan Hecht describes the creative process of developing a chemical concept, translating it into a molecular target structure, and realizing its synthesis. 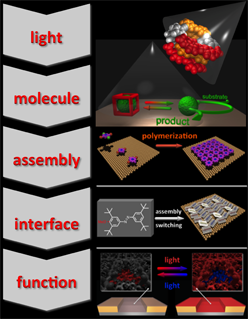 In this video clip, Stefan Hecht motivates his group’s research in smart light-responsive materials and explains in simple terms the underlaying principle of photoswitchable molecules. In this lecture, Stefan Hecht motivates research in the field of photoresponsive molecular systems, illustrates some achievements of his own research group, and finally highlights general scientific challenges in the field, before transitioning to the other speakers in the session. In diesem Interview motiviert Stefan Hecht seine Forschung in den Nanowissenschaften und erklärt die zugrundeliegende Philosophie und interdisziplinären Charakter. A poster summarizing our research activities is provided here. For more information see our research highlight section and read our publications.